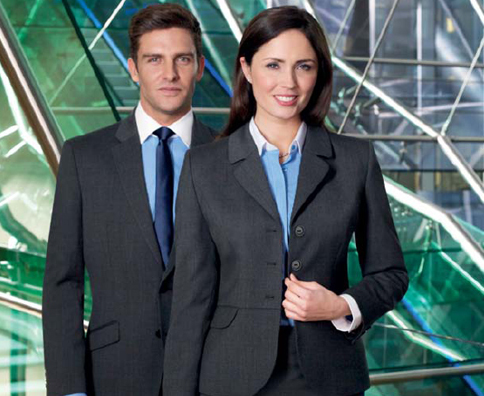 We have many years experience supplying the highest quality corporate uniforms to companies throughout the UK and Ireland. We provide beautifully tailored suits, shirts and blouses to teams looking for professional and stylish corporate workwear. Our local Customer Service Team will provide you with a helpful, efficient and friendly service throughout the ordering/delivery process and beyond. Contact Us Today on 0845 463 1018 (UK) / 01 813 8642 (ROI) or via email using the form further down this page. If you are bulk ordering, download our corporate workwear brochures located further down this page to view our extensive ranges. You can also shop online now for individual items or very small quantity orders. We want to help you and your staff dress for success in the office. That's why we've created this helpful guide to assembling corporate uniforms. Learn about the do's and don'ts of dressing for the office, how important fit and gament care is to the longevity of unforms, and get fashion tips on the latest corporate uniform trends. 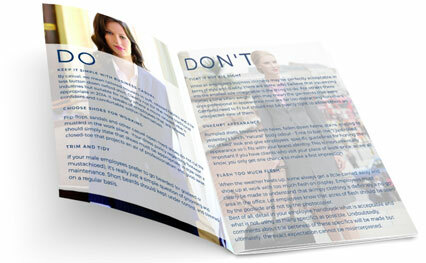 This guide will be especially useful to those responsible for co-ordinating new uniforms for their company. If you have a question, would like a copy of our catalogue, or need to arrange a presentation of our ranges, submit the form below and we'll get right back to you. "The Progressive Building Society appointed Work Uniforms Direct as supplier of our tailored uniforms several years ago and since then we have been most impressed with the quality of the suits and complimentary garments they have provided us with. Throughout this time, they have guided us through colours, cuts, styles and fabrics to smart, stylish and professional look for our substantial uniformed team. The rollout of our most recent uniform was carried out seamlessly and completed within a few weeks ensuring our team were wearing their new suits quickly. We have been delighted with the service Work Uniforms Direct provides which I am happy to describe as superb." “Monaghan Credit Union selected a smart, well priced uniform from Work Uniforms Direct. With a wide variety of styles and sizes to choose from, Work Uniforms Direct ensured our staff members could feel both professional and comfortable at work. Once we had placed the order, the delivery and after care service went smoothly. Based on our dealings with the company, we are therefore happy to recommend Work Uniforms Direct as a supplier”. “Our experience of ordering with Work Uniforms Direct is a very positive one. At Age NI, we find that the embroidered garments we use are of an excellent quality and their staff are both friendly and efficient. With this in mind, Age NI recommends them as a supplier”. Work Uniforms Direct also specialise in Healthcare Uniforms and Hospitality Uniforms for companies across the UK and Ireland.